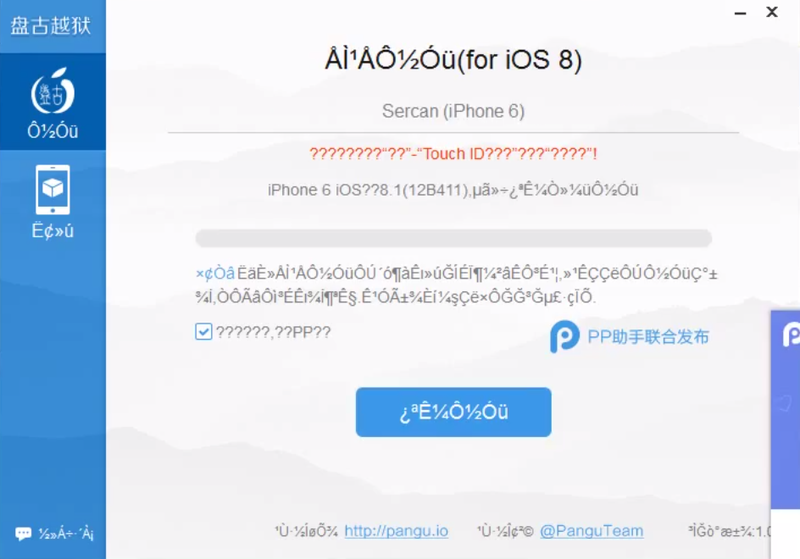 To everyone’s surprise, and as we reported first, the Pangu jailbreak for iOS 8 and iOS 8.1 was released earlier today courtesy of a mysterious team of Chinese jailbreak developers. This tutorial is for Windows users. Pangu team hasn’t released a Mac version yet. Step 2: Connect your device to your computer, and use iCloud or iTunes to back up any and all personal information that you need to keep safe. The jailbreak has been reported to be working in most cases, but on the off chance something goes wrong, it’s a good idea to have an escape plan. Step 3: The Pangu team says that if you’ve done an OTA update, the jailbreak might not work. So please do a fresh install of iOS 8.1. Step 4: Disable Passcode from Settings > Touch ID & Passcode and turn off Find my iPhone from Settings > iCloud > Find my iPhone. Step 5: Please launch the application as an Administrator. Right Click on the Pangu exe and select the “Run as Administrator” option. Step 6: You should be presented with a screen like the one seen below. The application is in Chinese, and if you don’t have the required Chinese fonts on your laptop, you might see question marks instead of Chinese text. Step 7: Uncheck the checkbox on the left that says “PP” and then click on the blue Jailbreak button. Step 8: You’ll see the progress of the jailbreak, and the current stage in the 6 step jailbreak process. Follow the on-screen instructions. Step 9: You’ll see that your device tells you there’s a restore in progress. Wait for your device to reboot several times. The entire process should take around 5 to 10 minutes. Step 10: After the jailbreak process completes, you’ll see a Pangu app on your device. This confirms that your device is jailbroken. While there’s no Cydia, you can install OpenSSH, and a few other tools to play around with the jailbroken iOS device’s file system. Hopefully, Cydia will be available through this app as well.